In 2009, the ozone hole reached its 10th largest measured size since careful measurements began in 1979.The daily maximum ozone hole area for 2009 was 24.4 million km2 on 17 September. 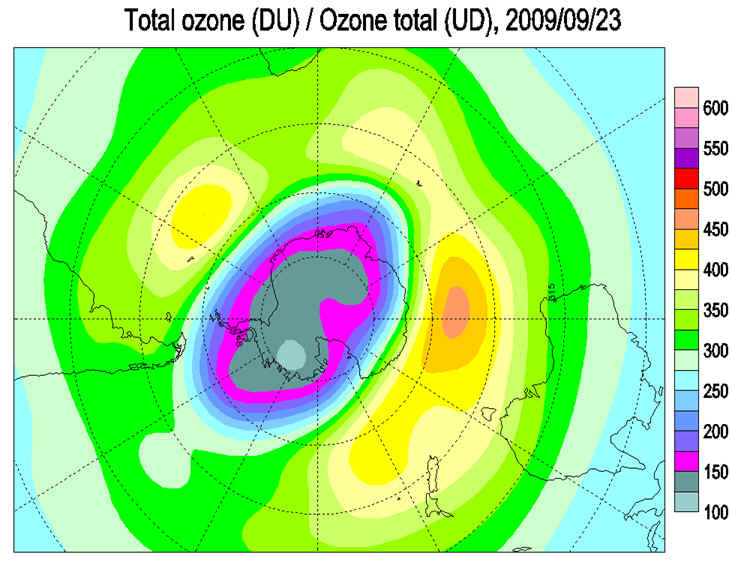 The daily minimum ozone value area for 2009 was 96 DU on 25 September. November 17, 2009 NOAA-The Antarctic ozone hole, which fluctuates throughout the late winter and spring in the southern hemisphere, reached its 2009 peak circumference in late September, according to measurements by NOAA researchers. Slightly smaller than the North American continent, the ozone hole covered 9.2 million square miles, according to NOAA satellite observations. This ranks as the 10th largest since satellite measurements began in 1979. Ozone over South Pole Station, Antarctica, also reached its thinnest point of the year on Sept. 26. Measured in Dobson Units (DU) that indicate the amount of ozone in a vertical column of air, the 2009 low level – 98 DU – is the seventh smallest since 1986. The record low of 89 DU was recorded on Oct. 6, 1993. 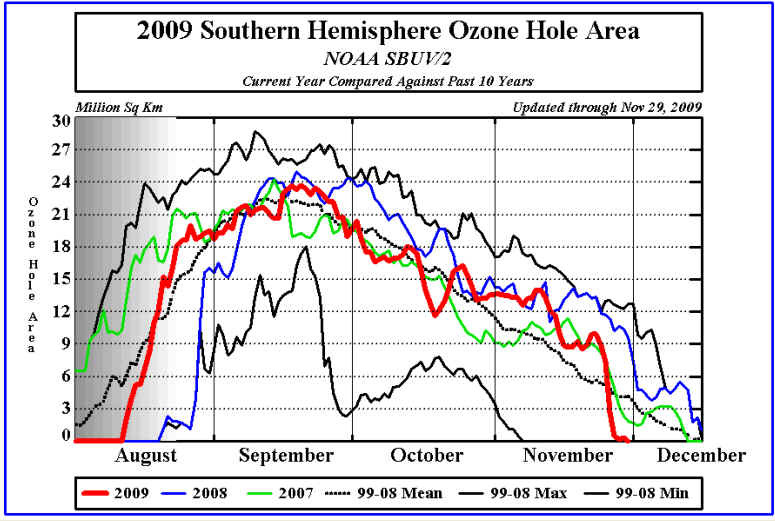 The 2009 ozone hole is essentially over, with most of the continent experiencing a stratospheric spring warming. The residual vortex is over the Dronning Maud Land and here minimum ozone values are around 240 DU and ozone depletion exceeds 30%. Ozone values outside the polar vortex have dropped to near 400 DU, and inside the vortex ozone values are rapidly increasing as the atmosphere warms, though the summer circulation is not yet fully established. The temperature of the ozone layer over Antarctica is now too warm for polar stratospheric clouds (PSCs) to form. During the early winter, the polar vortex was often rather more elliptical than it was in 2008, and this lead to some early depletion in circumpolar regions as stratospheric clouds became exposed to sunlight. It reverted to a more circular circulation as winter progressed and this led to another relatively slow start to the growth of the ozone hole (as measured by NASA/SBUV2), with the "hole" not beginning until mid August. The vortex became more elliptical again in late August, with South Georgia being affected by the fringes of the ozone hole between September 2 and 6. The hole grew to reach an area of around 24 million square kilometres by mid September, and then lasted until the end of November. From mid August to mid November it remained around the average area seen over the past decade. The tip of South America and South Georgia were affected by the fringes of the ozone hole from September 24 to September 30, from October 3 to October 7 and from November 8 to 25. South Georgia was affected on November 6. The 2009 ozone hole is nearing its end, with most of the continent experiencing a stratospheric spring warming. 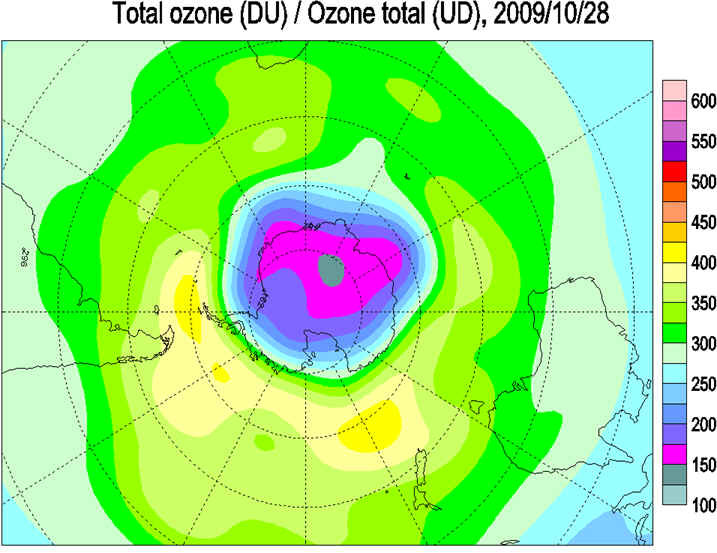 The residual vortex is over the Antarctic Peninsula and here minimum ozone values are around 200 DU and ozone depletion exceeds 40%. Ozone values outside the polar vortex have dropped to near 400 DU, and inside the vortex ozone values are rapidly increasing as the atmosphere warms. The temperature of the ozone layer over Antarctica is now too warm for polar stratospheric clouds (PSCs) to form. During the early winter, the polar vortex was often rather more elliptical than it was in 2008, and this lead to some early depletion in circumpolar regions as stratospheric clouds became exposed to sunlight. It reverted to a more circular circulation as winter progressed and this led to another relatively slow start to the growth of the ozone hole (as measured by NASA/SBUV2), with the "hole" not beginning until mid August. The vortex became more elliptical again in late August, with South Georgia being affected by the fringes of the ozone hole between September 2 and 6. The hole grew to reach an area of around 24 million square kilometres by mid September, but had declined to 9 million square kilometres by mid November, still a little larger than the average for the past decade. The tip of South America and South Georgia were affected by the fringes of the ozone hole from September 24 to September 30, from October 3 to October 7 and from November 8 to 25. South Georgia was affected on November 6. 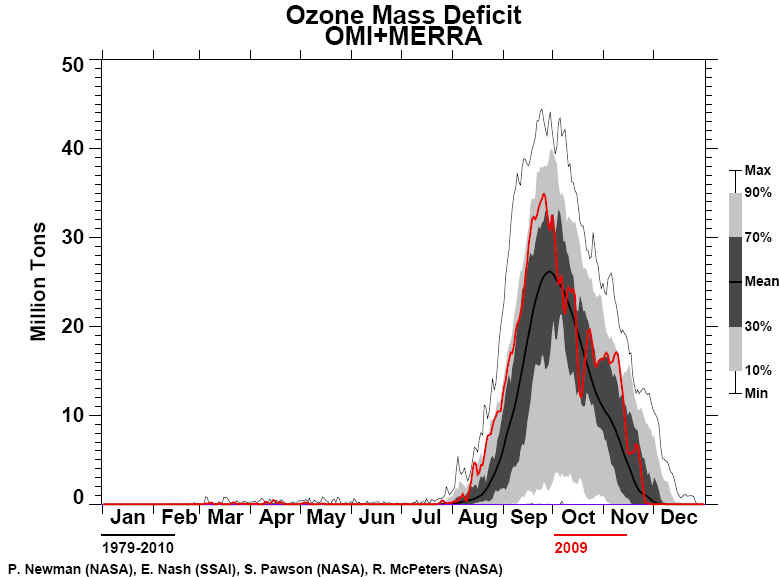 The 2009 ozone hole is now waning, with much of the continent experiencing a stratospheric spring warming. The residual vortex is over the Weddell Sea and Antarctic Peninsula and here minimum values are around 160 DU and depletion exceeds 50%. Ozone values outside the polar vortex have dropped to near 400 DU, and inside the vortex ozone values are increasing as the atmosphere warms. The temperature of the ozone layer over Antarctica is now rising, though a small area is still cold enough for polar stratospheric clouds (PSCs) to exist. During the early winter, the polar vortex was often rather more elliptical than it was in 2008, and this lead to some early depletion in circumpolar regions as stratospheric clouds became exposed to sunlight. It reverted to a more circular circulation as winter progressed and this led to another relatively slow start to the growth of the ozone hole (as measured by NASA/SBUV2), with the "hole" not beginning until mid August. The vortex became more elliptical again in late August, with South Georgia being affected by the fringes of the ozone hole between September 2 and 6. The hole grew to reach an area of around 24 million square kilometres by mid September, but had declined to 12 million square kilometres by mid November. It is now a little larger than the average for the past decade. The tip of South America and South Georgia were affected by the fringes of the ozone hole from September 24 to September 30 and again from October 3 to October 7. 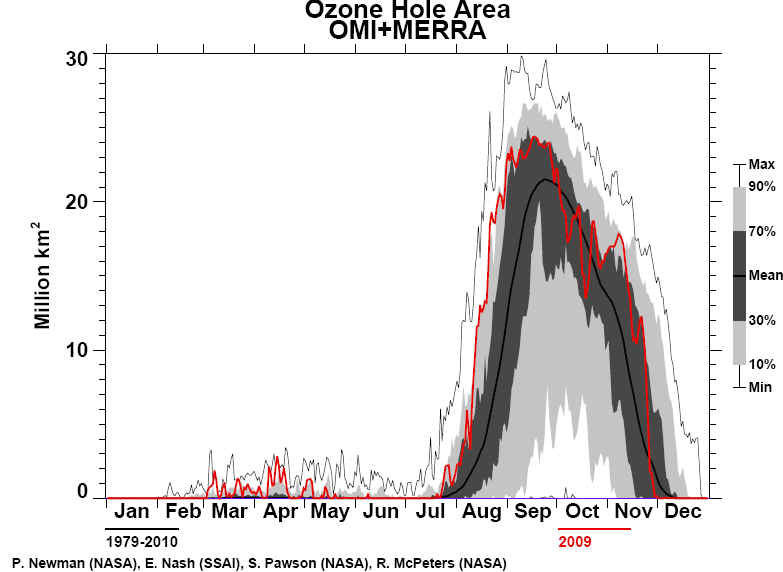 The 2009 ozone hole is now waning. Ozone values outside the polar vortex remain near 450 DU in places, and inside the vortex ozone values are increasing as the atmosphere warms. Lowest values are over East Antarctica with minimum values below 150 DU and depletion exceeding 50% over much of this area,. Unusually, the highest values are over the Drake Passage. The temperature of the ozone layer over Antarctica is now rising, though a small area is still cold enough for polar stratospheric clouds (PSCs) to exist. During the early winter, the polar vortex was often rather more elliptical than it was in 2008, and this lead to some early depletion in circumpolar regions as stratospheric clouds became exposed to sunlight. It reverted to a more circular circulation as winter progressed and this led to another relatively slow start to the growth of the ozone hole (as measured by NASA/SBUV2), with the "hole" not beginning until mid August. The vortex became more elliptical again in late August, with South Georgia being affected by the fringes of the ozone hole between September 2 and 6. The hole grew to reach an area of around 24 million square kilometres by mid September, but had declined to 16 million square kilometres by late October, similar to the average for the past decade. The tip of South America and South Georgia were affected by the fringes of the ozone hole from September 24 to September 30 and again from October 3 to October 7. 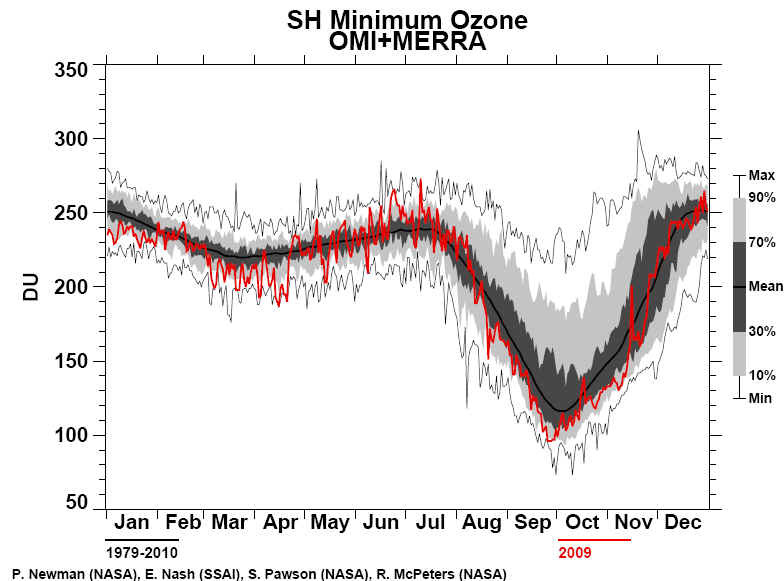 The 2009 ozone hole is now waning. Ozone values outside the polar vortex remain near 450 DU in places, and inside the vortex ozone values are increasing as the atmosphere warms. Lowest values are over East Antarctica with minimum values below 150 DU and depletion exceeding 50% over much of this area,. Unusually, the highest values are over the Bellingshausen Sea. The temperature of the ozone layer over Antarctica is now rising, though a small area is still cold enough for polar stratospheric clouds (PSCs) to exist. During the early winter, the polar vortex was often rather more elliptical than it was in 2008, and this lead to some early depletion in circumpolar regions as stratospheric clouds became exposed to sunlight. It reverted to a more circular circulation as winter progressed and this led to another relatively slow start to the growth of the ozone hole (as measured by NASA/SBUV2), with the "hole" not beginning until mid August. The vortex became more elliptical again in late August, with South Georgia being affected by the fringes of the ozone hole between September 2 and 6. The hole grew to reach an area of around 24 million square kilometres by mid September, but had declined to 11 million square kilometres by mid October. The tip of South America and South Georgia were affected by the fringes of the ozone hole from September 24 to September 30 and again from October 3 to October 7. The 2009 ozone hole has formed over the heart of the continent. Ozone values north of the polar vortex are near 450 DU in places, whilst inside the vortex ozone values are still dropping as ozone depletion intensifies. Lowest values are over the centre of the continent, with minimum values below 120 DU. Ozone levels are below normal across the continent, with depletion exceeding 50% in the worst affected areas, and there are areas above normal in the circumpolar belt. The temperature of the ozone layer over Antarctica is just past the annual minimum, and a large area is cold enough for polar stratospheric clouds (PSCs) to form. During the early winter, the polar vortex was often rather more elliptical than it was in 2008, and this lead to some early depletion in circumpolar regions as stratospheric clouds became exposed to sunlight. It reverted to a more circular circulation as winter progressed and this led to another relatively slow start to the growth of the ozone hole (as measured by NASA/SBUV2), with the "hole" not beginning until mid August. The vortex became more elliptical again in late August, with South Georgia being affected by the fringes of the ozone hole between September 2 and 6. The hole grew to reach an area of around 24 million square kilometres by mid September, but declined to 21 million square kilometres towards the end of the month. Forecasts suggest that the tip of South America has been affected by the fringes of the ozone hole from September 24 for several days and will be again from around October 4. The 2009 ozone hole has formed over the heart of the continent. Ozone values north of the polar vortex are near 450 DU in places, whilst inside the vortex ozone values are still dropping as ozone depletion intensifies. Lowest values are over the centre of the continent, with minimum values below 120 DU. Ozone levels are below normal across the continent, with depletion exceeding 50% in the worst affected areas, and there are areas above normal in the circumpolar belt. The temperature of the ozone layer over Antarctica is just past the annual minimum, and a large area is cold enough for polar stratospheric clouds (PSCs) to form. During the early winter, the polar vortex was often rather more elliptical than it was in 2008, and this lead to some early depletion in circumpolar regions as stratospheric clouds became exposed to sunlight. It reverted to a more circular circulation as winter progressed and this led to another relatively slow start to the growth of the ozone hole (as measured by NASA/SBUV2), with the "hole" not beginning until mid August. The vortex became more elliptical again in late August, with South Georgia being affected by the fringes of the ozone hole between September 2 and 6. It had reached an area of around 24 million square kilometres by mid September. Forecasts suggest that the tip of South America has been affected by the fringes of the ozone hole from September 24 for several days and will be again from around October 4. The 2009 ozone hole has formed over the heart of the continent. Ozone values north of the polar vortex are near 450 DU in places, whilst inside the vortex ozone values are still dropping as ozone depletion intensifies. Lowest values run in a broad swath from the Amundsen Sea to Dronning Maud Land, with minimum values below 150 DU. Ozone levels are below normal across the continent, with depletion exceeding 50% in the worst affected areas, and there are areas above normal in the circumpolar belt. The temperature of the ozone layer over Antarctica is just past the annual minimum, and a large area is cold enough for polar stratospheric clouds (PSCs) to form. During the early winter, the polar vortex was often rather more elliptical than it was in 2008, and this lead to some early depletion in circumpolar regions as stratospheric clouds became exposed to sunlight. It reverted to a more circular circulation as winter progressed and this led to another relatively slow start to the growth of the ozone hole (as measured by NASA/SBUV2), with the "hole" not beginning until mid August. The vortex became more elliptical again in late August, with South Georgia being affected by the fringes of the ozone hole between September 2 and 6. It had reached an area of around 24 million square kilometres by mid September. Forecasts suggest that the tip of South America will be affected by the fringes of the ozone hole from September 24 for several days. The 2009 ozone hole has formed over the heart of the continent. Ozone values are building north of the polar vortex, and are above 450 DU in places, whilst inside the vortex ozone values are dropping as ozone depletion intensifies. Lowest values run from the Amundsen Sea to Dronning Maud Land, with minimum values below 150 DU. Ozone levels are below normal across the continent, with depletion exceeding 50% in the worst affected areas, and there are areas above normal in the circumpolar belt. The temperature of the ozone layer over Antarctica is just past the annual minimum, and a large area is cold enough for polar stratospheric clouds (PSCs) to form. During the early winter, the polar vortex was often rather more elliptical than it was in 2008, and this lead to some early depletion in circumpolar regions as stratospheric clouds became exposed to sunlight. It reverted to a more circular circulation as winter progressed and this led to another relatively slow start to the growth of the ozone hole (as measured by NASA/SBUV2), with the "hole" not beginning until mid August. The vortex became more elliptical again in late August, with South Georgia being affected by the fringes of the ozone hole between September 2 and 6. It had reached an area of around 24 million square kilometres by mid September. Forecasts suggest that the tip of South America may be affected by the fringes of the ozone hole from September 24 for several days. 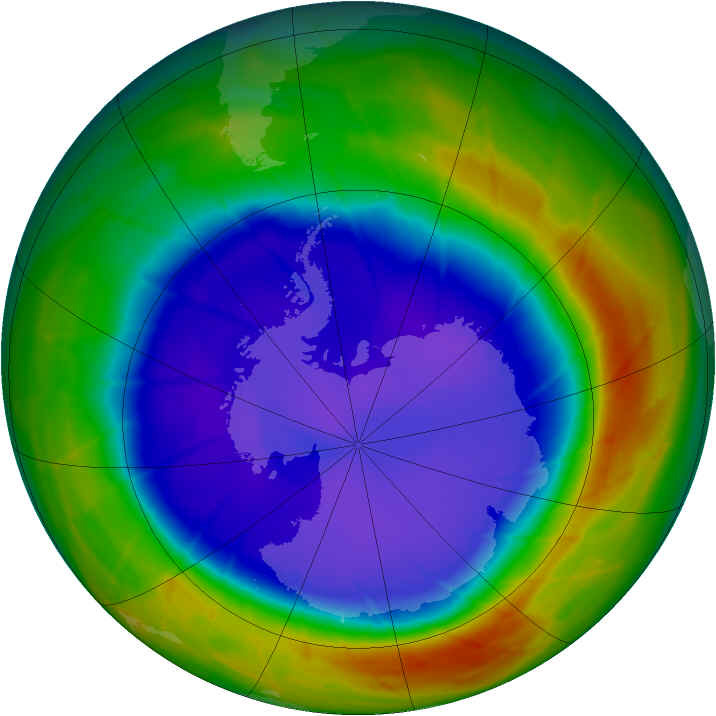 The 2009 ozone hole has formed over the heart of the continent. Ozone values are building north of the polar vortex, and are above 450 DU in places, whilst inside the vortex ozone values are dropping as ozone depletion intensifies. Lowest values are over the Pole with minimum values below 150 DU. Ozone levels are below normal across the continent, with depletion exceeding 50% in the worst affected areas, and there are areas above normal in the circumpolar belt. The temperature of the ozone layer over Antarctica is just past the annual minimum, and a large area is cold enough for polar stratospheric clouds (PSCs) to form. During the early winter, the polar vortex was often rather more elliptical than it was in 2008, and this lead to some early depletion in circumpolar regions as stratospheric clouds became exposed to sunlight. It reverted to a more circular circulation and this led to another relatively slow start to the growth of the ozone hole (as measured by NASA/SBUV2), with it reaching an area of around 22 million square kilometres by mid September. The vortex became more elliptical again in late August, with South Georgia being affected by the fringes of the ozone hole between September 2 and 6. 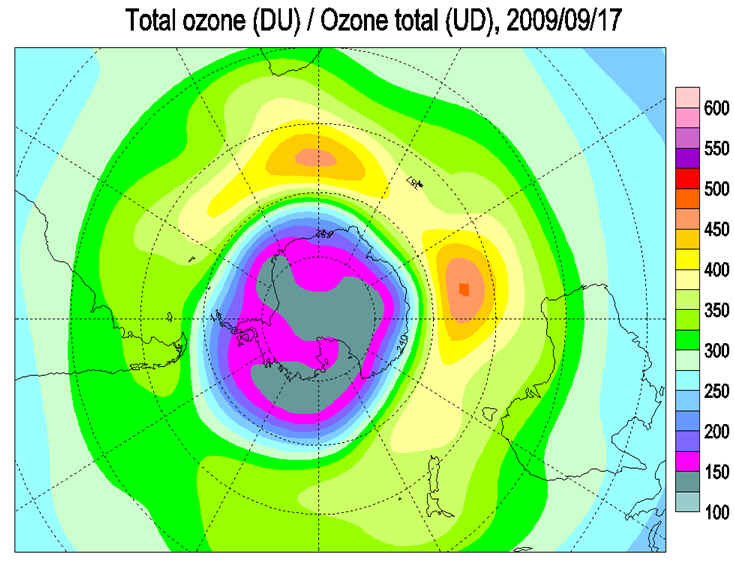 2009 September 17 NASA Earth Observatory The annual ozone hole started developing over the South Pole in late August 2009, and by September 10, it appeared that the ozone hole of 2009 would be comparable to ozone depletions over the past decade. This composite image from September 10 depicts ozone concentrations in Dobson units, with purple and blues depicting severe deficits of ozone. The image was made from data collected by the Ozone Monitoring Instrument onboard NASA’s Aura satellite. “We have observed the ozone hole again in 2009, and it appears to be pretty average so far,” said ozone researcher Paul Newman of NASA’s Goddard Space Flight Center in Greenbelt, Maryland. “However, we won’t know for another four weeks how this year’s ozone hole will fully develop.” September 16 marks the International Day for the Protection of the Ozone Layer, declared by the United Nations to commemorate the date when the Montreal Protocol was signed to ban use of ozone-depleting chemicals such as chlorofluorocarbons (CFCs). Scientists are tracking the size and depth of the ozone hole with observations from the Ozone Monitoring Instrument on NASA’s Aura spacecraft, the Global Ozone Monitoring Experiment on the European Space Agency’s ERS-2 spacecraft, and the Solar Backscatter Ultraviolet instrument on the National Oceanic and Atmospheric Administration’s NOAA-16 satellite. The depth and area of the ozone hole are governed by the amount of chlorine and bromine in the Antarctic stratosphere. Over the southern winter, polar stratospheric clouds form in the extreme cold of the atmosphere, and chlorine gases react on the cloud particles to release chlorine into a form that can easily destroy ozone. When the sun rises in August after months of seasonal polar darkness, the sunlight heats the clouds and catalyzes the chemical reactions that deplete the ozone layer. 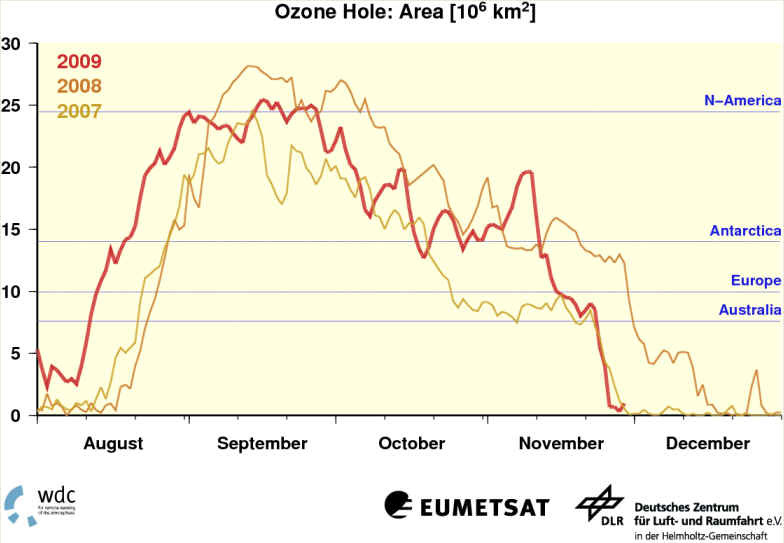 The ozone hole begins to grow in August and reaches its largest area in late September to early October. Recent observations and several studies have shown that the size of the annual ozone hole has stabilized and the level of ozone-depleting substances has decreased by 4 percent since 2001. But since chlorine and bromine compounds have long lifetimes in the atmosphere, a recovery of atmospheric ozone is not likely to be noticeable until 2020 or later. The 2009 ozone hole has formed over the heart of the continent. Ozone values are building north of the polar vortex, and are above 400 DU in places, whilst inside the vortex ozone values are dropping as ozone depletion intensifies. Lowest values are over the Weddell Sea with minimum values below 170 DU. Ozone levels are below normal across the continent, with depletion exceeding 40% in the worst affected areas, and there are areas above normal in the circumpolar belt. The temperature of the ozone layer over Antarctica is still generally cooling, and a large area is cold enough for polar stratospheric clouds (PSCs) to form. During the early winter, the polar vortex was often rather more elliptical than it was in 2008, and this lead to some early depletion in circumpolar regions as stratospheric clouds became exposed to sunlight. It reverted to a more circular circulation and this led to another relatively slow start to the growth of the ozone hole (as measured by NASA/SBUV2), with it reaching an area of around 17 million square kilometres by early September. The vortex became more elliptical again in late August, with South Georgia being affected by the fringes of the ozone hole between September 2 and 6. The daily minimum temperatures at the 50 hPa level have been close to or below the 1979-2008 average. Until mid June the minimum temperatures at 50 hPa were below those of 2007 and 2008. In July and August the minimum temperature has been close to the long-term average and somewhat warmer than in 2008. The 50 hPa temperatures averaged over the 60-90°S region have been quite close to the long-term mean until the end of July. During August the temperature has decreased and by 18 August it is close to the 1979-2008 minimum. A similar development is also seen at the 30 and 70 hPa levels. At 10 hPa the 60-90°S region has been colder than the longterm mean most of the winter and the last few days it has been colder than the 1979-2008 minimum. Since the onset of NAT temperatures in mid May the NAT area has been close to or above the 1979-2008 average. In the beginning of August the NAT area increased somewhat and is now near the 10th percentile, meaning that only 10% of the winters since 1979 have had a larger NAT area at this time of the year. Presently the vortex is more elongated than at the same time last year. This has led to an earlier onset of ozone depletion than usual. On certain days in mid August the area of the ozone hole was larger than for the same dates in 2000, the year with the earliest onset of ozone depletion so far. The geographical extent of the south polar vortex at the isentropic levels 460 K and 500 K has been higher than the1979-2008 average on almost every day since early April. Since mid July the vortex area has been close to the 1979- 2008 average. The longitudinally averaged heat flux between 45°S and 75°S is an indication of how much the stratosphere is disturbed. From April to now the heat flux has been lower than the 1979-2008 average, except for a period of some weeks in June and the first half of July. In mid-July, the heat flux decreased somewhat and has, since then, been below the 1979-2008 average. This is a sign of a stable vortex. At the altitude of ~18 km the vortex is now almost entirely depleted of HCl, one of the reservoir gases that can be transformed to active chlorine. In the sunlit collar along the vortex edge there is 1.5 - 1.8 ppb of active chlorine (ClO), and ozone depletion has already started. The south polar vortex is less concentric in 2009 than in 2008, and this has led to an early onset of ozone depletion. As the sun returns to Antarctica after the polar night, it is expected that ozone destruction will speed up. It is still too early to give a definitive statement about the development of this year's ozone hole and the degree of ozone loss that will occur. This will, to a large extent, depend on the meteorological conditions. WMO and the scientific community will use ozone observations from the ground, from balloons and from satellites together with meteorological data to keep a close eye on the development during the coming weeks and months. The 2009 ozone hole is forming over the heart of the continent. Ozone values are building north of the polar vortex, and are approaching 400 DU, whilst inside the vortex ozone values are dropping as ozone depletion intensifies. Lowest values are over West Antarctica and here a few areas are below 200 DU. Ozone levels are below normal across the continent, with depletion exceeding 30% in the worst affected areas, and there are areas above normal in the circumpolar belt. The temperature of the ozone layer over Antarctica is still generally cooling, and a large area is cold enough for polar stratospheric clouds (PSCs) to form. The polar vortex is often rather more elliptical than it was in 2008, and this lead to some early depletion in circumpolar regions as stratospheric clouds became exposed to sunlight, however it has reverted to a more circular circulation. 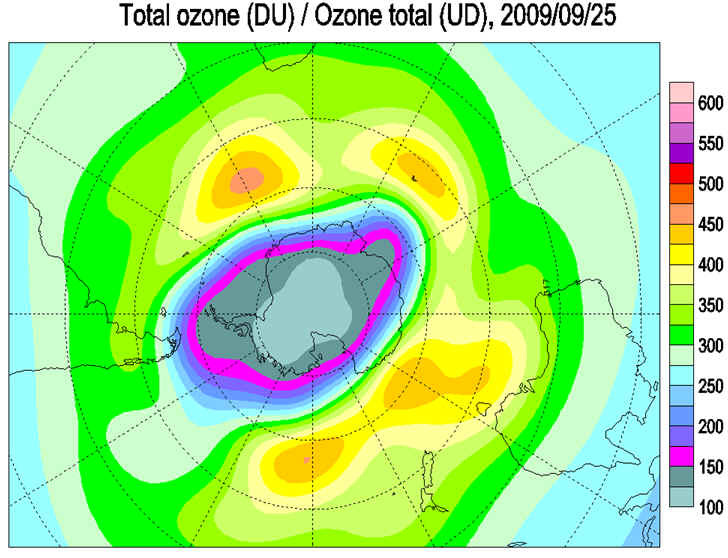 The 2009 ozone hole is beginning to form over the heart of the continent. Ozone values are building north of the polar vortex, and are approaching 400 DU, whilst inside the vortex ozone values are dropping as ozone depletion intensifies. Lowest values are over Elsworth Land and here they are below 220 DU. Ozone levels generally remain below normal across the continent, though there are areas above normal in the circumpolar belt. The temperature of the ozone layer over Antarctica is still generally cooling, and a large area is cold enough for polar stratospheric clouds (PSCs) to form, though for the first time for about a year, the mean 70 hPa temperature is above average. The polar vortex is often rather more elliptical than it was in 2008, and this lead to some early depletion in circumpolar regions as stratospheric clouds became exposed to sunlight, however it has reverted to a more circular circulation. The scene is set for the 2009 season and the ozone hole is beginning to form over the heart of the continent. Contrasts have increased now that the polar vortex has formed with some circumpolar areas approaching 400 DU and the centre of the continent below 220 DU. Ozone levels generally remain below normal across the continent, though there are areas above normal in the circumpolar belt. The temperature of the ozone layer over Antarctica is still generally cooling, and a large area is cold enough for polar stratospheric clouds (PSCs) to form, though for the first time for about a year, the mean 70 hPa temperature is above average. The polar vortex is often rather more elliptical than it was in 2008, and this has lead to some early depletion in circumpolar regions as stratospheric clouds become exposed to sunlight, however it has reverted to a smaller, more circular circulation in the last week. The scene is being set for the 2009 season and the ozone hole is beginning to form over the heart of the continent. Contrasts are increasing as the polar vortex builds with some circumpolar areas now approaching 400 DU and the centre of the continent below 220 DU. Ozone levels generally remain below normal across the continent, though there are areas above normal in the circumpolar belt. The temperature of the ozone layer over Antarctica is still cooling, and a large area is now cold enough for polar stratospheric clouds (PSCs) to form. The ozone layer temperature remains generally a little below the normal. The polar vortex is often rather more elliptical than it was in 2008, and this has lead to some early depletion in circumpolar regions as stratospheric clouds become exposed to sunlight. The scene is being set for the 2009 season. Contrasts are increasing as the polar vortex builds with some circumpolar areas now above 370 DU and parts of the continent below 220 DU. Ozone levels generally remain below normal across the continent, though there are areas above normal in the circumpolar belt. The temperature of the ozone layer over Antarctica is cooling from the summer maximum, and an increasing area is now cold enough for polar stratospheric clouds (PSCs) to form. The ozone layer temperature remains generally a little below the normal. The polar vortex appears rather more elliptical than it was in 2008.